Sometimes we get to do things that the game didn’t plan for. We can’t exactly break the rules – unless we want to fall through the game world or glitch out – but we can bend the rules for our amusement. We’ve all done it. (Yes you have, don’t lie). Sometimes we misbehave because we’re looking for a laugh, sometimes we do it because the game isn’t what we expected. Other times, we play the wrong way to see if the video game will stop us. This was going to be a one-off article with several examples, but I soon realised this was turning into a biiig looong blogpost. So instead I’ve picked out one game that I played incorrectly. If this proves to be an interesting read, then I’ll bring out the other examples later. So Dishonored…. a game that I will never play again. Don’t get me wrong, I enjoyed it. But this game made me a bad person for a few hours. 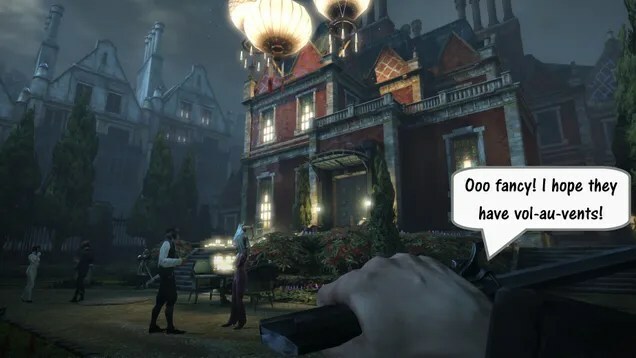 By the time I was finished with the steam-punk, industrial city-state of Dunwall, there wasn’t a single person left alive. Everyone died.Every. Single. Person. The game sets you off with two distinct, gameplay options. You can be all-stealth and non-lethal or you can be a little stealthy and plenty-murdery. I started with the second option. For me, this was an easy choice. Firstly, I am bad a stealth (really, really bad) so I’m going to murder lots of people who happen to spot me. Secondly, the game tells you that TERRIBLE AND DARK AND SPOOKY THINGS WILL HAPPEN IF YOU KILL PEOPLE… so of course I was going to find out what happens when I go a-killing. So I started with the sneaky-killer style, slicing up anyone who was in my way, using bullets and crossbow bolts whenever things got a little heated, generally doing what the game wanted… and then I unlocked the Devouring Storm. Rats in Dunwall are a teensy weensy bit aggressive. As in, they will literally reduce a person down to gristle in a few seconds if said person so much as looks in their direction. And the Devouring Swarm imbues Corvo, the protagonist, with the ability to summon a pack of these little critters. A nice way to take out a single enemy without leaving the shadows. I’d enter a new area a find my first target. No planning, no sneaking about. I’d immediately summon my squeaky friends under the feet of an unsuspecting henchmen. Of course, all the henchmen’s friends come running over to stomp and stab the evil rat swarm back to hell. The game had tried to tell me that the Swarm only works when there are one or two baddies to nibble on. But I wasn’t perturbed. Rather than changing tactics, I’d summon a second Swarm the moment the first one vanished. If you wait a moment between casting spells, some of the magic you used up is replenished. So I’d stand and watch as the henchmen swung at wave after wave of ravenous rodents until they began to fall, one by one. At first I just wanted to see how long this tactic would work before the game became too difficult or insisted that I use a more cunning approach. Maybe I would use up my man potions too quickly and have to rely on my sword and pistol to do the killing. And yes, occasionally I’d be low on magic and have to finish the rat-bitten fiends of with a few sword swipes, but not as often as I expected. When a character was impervious to this ability, such as the Tallboys (henchmen on stilts) I would have so much surplus ammunition lying around that I could riddle them with holes and return to summoning rodents. The only thing I ever used in-game currency for was more mana potions. You might be thinking, “Mr RedHeadPeak”, surely by relying on one move for most of the game, you are sucking the fun out?” I was worried about that at first, but soon realised that I was making the game my own. 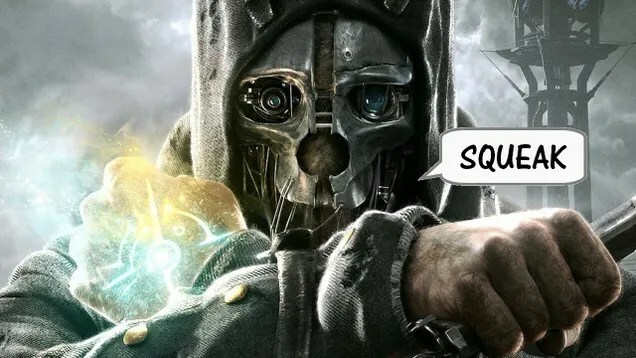 The story suggests two possible versions of Corvo were available – the innocent fellow out to defend his honour, or a troubled man out for revenge. My version of Corvo was my own creation: The Walking Plague. I began to revel in my one-trick approach to the game. In my head Corvo was a broken man long before the story started, and his new-found dark powers would allow him to purge the world he hates. Soon I began to test just how far the game would let me push this approach. I began to unleash the swarm on non-aggressive Non Player Characters. It didn’t matter how innocent the bystander was, they were food for my rat army. The real test came when the game announced that I was to attend a Masquerade Ball in order to disgrace/assassinate a politician’s lady friend. A manor house awaited me, full of wealthy nobility. Only one person needed to die, and most of the guards and party guests were irrelevant to the mission (there are several routes through the building). But I had a test to carry out, so I found myself in one corner of the house and began to unleash my rats. I had a full Mana Bar and a wholes set of potions. Twenty minutes later, everyone was dead. The guards, the guests, my target and her body doubles. I had remained almost completely undetected for the duration. I lost count of how many swarms I spawned one after the other. With each attack new guards came to face the invading creatures, but it was only a matter of time for they succumbed to the hundreds of tiny, razor-sharp teeth. I wasn’t entirely inactive; I’d swipe my sword at the occasional panicked goon, or fire an incendiary into the mix. But I mostly sat back as each and every NPC fell. Dishonored sets itself up as a game where you can kill anyone you want, using a variety of skills, but you’re better off if you don’t. Even if you don’t want to take the non-lethal route, the game still holds up several opportunities to do some good in the world. Most importantly, the gamer should use a mix of all the skills available to win. I not only chose to ignore all those guidelines, but I decided to see just how much I could misbehave. And boy, did I misbehave. Next week, I’ll talk about a completely contrasting kind of misbehaviour. A very childish and very silly kind of behaviour. I became the Monster when I played Dishonored, but I became the Prankster when I played Lara Croft and the Guardian of Light. 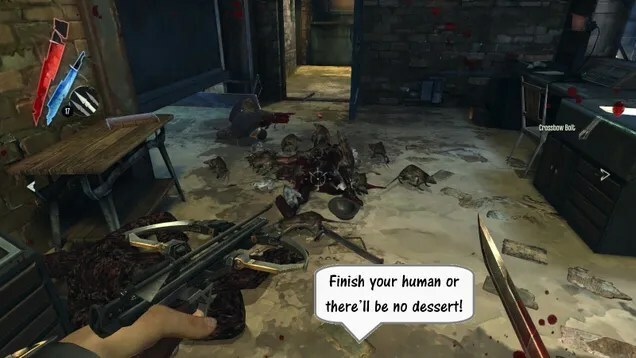 Did you have a similar experience with Dishonored? Are there other games where you’ve felt like you were misbehaving? How often do you push a video game just to see if it will bend or break? Leave a comment below! You can contact me via Twitter @RedHeadPeak, through my blog on WordPress or my Facebook page. ← What Should Really Anger Gamers?